Below are the preliminary landings estimates for 2015 in metric tons (mt) and pounds (lb) dressed weight (dw) for the Atlantic shark commercial fisheries; 1 mt is equal to 2,204.6 pounds. These preliminary estimates are based on dealer reports and other information received from January 1 through December 31, 2015. The estimates include landings by state-only permitted vessels, federally permitted vessels, and the 2015 shark research fishery participants. 1 The blacktip, aggregated LCS, and hammerhead shark management group preliminary 2015 landings were split based on the sub-regional quota percentage splits established in Amendment 6 to the 2006 Consolidated HMS FMP. 2 Fishery closed at 11:30 p.m. local time on May 3, 2015 (80 FR 24836). 3 Fishery closed at 11:30 p.m. local time on July 4, 2015 (80 FR 38016). In the final rule for Amendment 6 to the 2006 Consolidated HMS FMP (80 FR 50073; August 18, 2015), NMFS reopened the Gulf of Mexico non-blacknose SCS fishery and prohibited the retention of blacknose sharks in the Gulf of Mexico region. 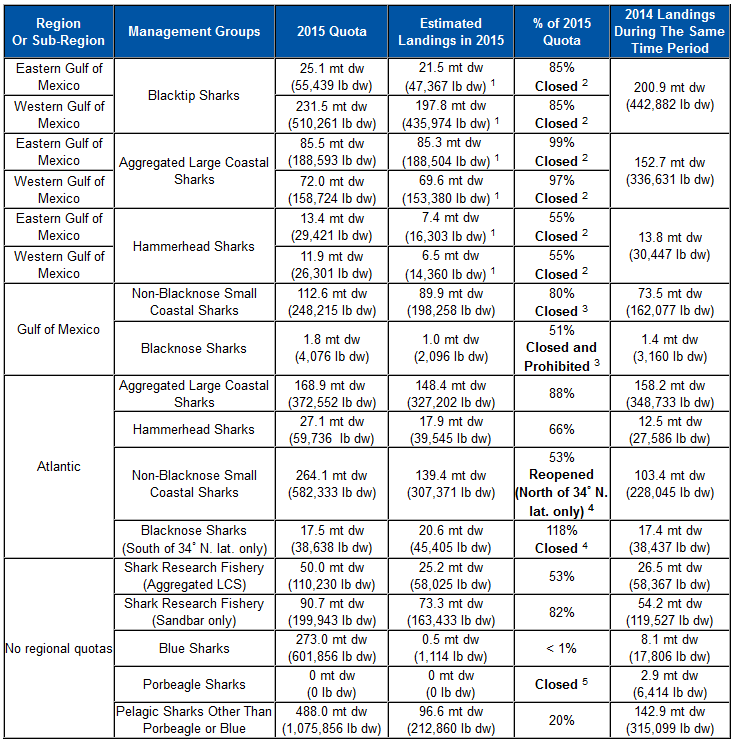 4 Fishery closed at 11:30 p.m. local time on June 7, 2015 (80 FR 32040), but the non-blacknose SCS fishery was reopened on August 18, 2015 (80 FR 50073) for sharks caught north of 34° N. lat. only. 5 Fishery closed at 11:30 p.m. local time on December 17, 2014 and will remain closed for the 2015 shark fishing season (79 FR 75068). This notice is a courtesy to the HMS fishery participants to help keep you informed about the fishery. What do you do with these sharks? Do people eat them?